Hirschsprung’s disease-related short bowel syndrome (HDSBS) is characterized by aganglionosis that extends orally to 75 cm from Treitz’s band. The condition is reported be associated with a high mortality rate of 50–80%. This retrospective study aimed to survey the current trends in HDSBS treatment in Japan. Patient data were extracted from the results of a nationwide survey we conducted, resulting in the retrospective collection of the data of 1087 HD patients from 2008 to 2012 in Japan. A total of 11 (0.9%) cases of HDSBS were noted. All patients underwent jejunostomy as neonates. Radical procedures performed in five patients (A-colon patch method in four, Duhamel’s procedure in one). Ziegler’s myotomy-myectomy and serial transverse enteroplasty (STEP) were performed in each patient as palliative procedures. No radical operations were performed in 4 of the 11 cases. The mortality rate was 36.4%. Four patients died, 1 patient who underwent STEP and 3 patients who received no radical procedures. The causes of death were sepsis due to enterocolitis or central intravenous catheter infection, and hepatic failure. All patients who underwent radical procedures survived and showed satisfactory outcomes. HDSBS still showed a high mortality rate, although surgical approaches such as the A-colon patch method resulted in satisfactory outcomes. The Japanese Study Group for Hirshsprung’s disease: Satoshi Obata, Satoshi Ieiri, Takashi Akiyama, Naoto Urushihara, Hisayoshi Kawahara, Masayuki Kubota, Miyuki Kono, Yuji Nirasawa, Shohei Honda, Masaki Nio, Tomoaki Taguchi. 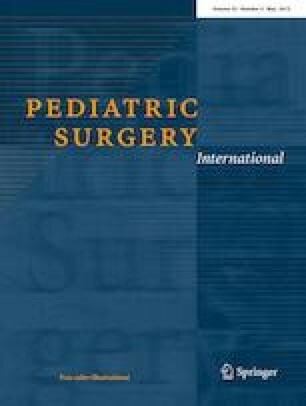 The authors wish to thank all the doctors in the 156 pediatric surgery departments at major universities and hospitals throughout Japan for replying to the questionnaires. This study was supported by a grant from The Ministry of Health, Labour and Welfare of Japan (Health and Labour Sciences Research Grants for Research on Intractable Diseases (H26-045)). The authors also thank Brian Quinn for his comments and help with the manuscript. All procedures performed in studies involving human participants were in accordance with the ethical standards of the institutional and/or national research committee and with the 1964 Declaration of Helsinki and its later amendments or comparable ethical standards. All subjects gave their informed consent prior to their inclusion in this study. This retrospective study was also approved by the clinical research ethics committee of Kyushu University Hospital (No. 27-273 and 28-155).